Convenient, timely trash and recycling services and dumpster rentals for Ohio homeowners. Customized, cost-effective disposal solutions for any commercial waste management needs. Responsible, effective trash and recycling service options to fit your community’s needs. Innovation and excellence are the cornerstones of our business, and it’s been that way since we began in 1948. 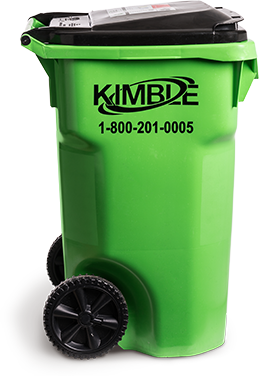 At Kimble, we promise that our family of services - including waste removal and recycling - are delivered in ways that are environmentally conscious, cost-efficient and customer-centered. Kimble is more than just "waste disposal." Our customers are also our neighbors, and we treat them as such. We’re reliable, attentive and experienced professionals who provide unmatched customer service to the residents in our service areas. We are 100% committed to keeping Eastern Ohio clean and happy—after all, we live here too.